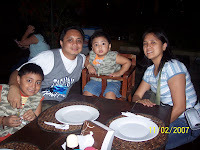 During the long break, my wife and I decided to take the kids out to Tagaytay. 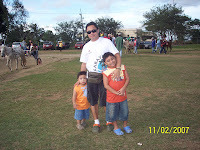 We were planning to go horse back riding, but the horses were limited and we have to wait from a long line to have our turn. 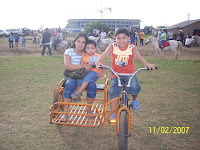 We don't have the luxury of time, so we let the kids ride the bike instead. Afterwards, we went to Residence Inn to visit the mini-zoo. The kids enjoyed the animals that we lost track of time. It was already dark that we decided to have our dinner at the place as well. We went home around 7 PM. 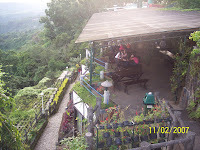 Tagaytay is really great. 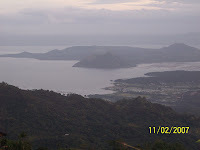 The weather is perfect and the views are really amazing, particulary Taal Lake and Volcano. 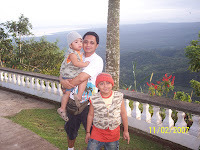 It's an almost 2 hours drive from Batangas City. And with respect to Manila, I believe travel time is almost the same. 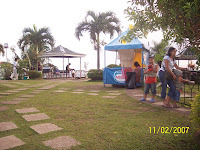 It's the summer capital of Southern Luzon, Philippines. As regards to Residence Inn, the place is okay. It's a hotel inn and restaurant also. 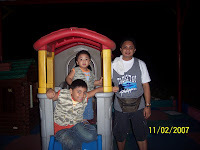 It has a viewdeck, garden, mini-zoo, and serpentarium that the kids will truly enjoy. For the thrill-seekers, you can have a live animal encounter and have your pictures taken with the tiger cubs, of course, for a fee. We plan on coming back and perhaps having an overnight stay. And on our next visit, we'll make sure that the kids will experience riding a horse. As a whole, it was a very tiring and enjoying adventure. 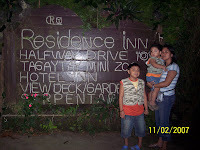 My personal rating of Tagatay and Residense Inn: 7.5 and 7 out of 10 respectively.